Gateway, with video. Isn't totalitarian socialist revolution a beautiful thing? But where�are Cindy and Sean and the rest of the American Chavistas today, when they could be helping to shoot freedom-seeking students to advance the cause?�Maybe they are too busy today? Well, then�call Warren Beatty. And why, why,�do potentially prosperous and happy�South American countries�keep falling for�this dictator business, socialist or otherwise? It's a damn shame. "And why, why, do potentially prosperous and happy South American countries keep falling for this dictator business, socialist or otherwise"? And when are Venezuela's students gonna learn one takes a gun to a gunfight. The shortest shorthand explanation: not enough middle class. The problem is that the time it takes to institutionalize the conditions of the corrective is out of synch with the immediacy of the demagogue's dream-talk. Pope John Paul II did great work with his message that capitalism is best at delivering the needed goods. This message took the wind out of ''liberation theology'' but then along came another instance of totalitarianism in the person of Hugo. I agree Buddy - not enough middle class. And as you said in an earlier post, Venezuela is a prime example. But there is also something else. In Latin America as a whole, there is little of what we would call civic involvement, or a universal sense of citizenship and the obligations of citizenship. You don't volunteer to help out - to pick up the trash in the park or to organize a soccer league for your town's kids. There is nothing like the inclination toward associations of which Tocqueville spoke. I think you're right. Hundreds of years of exploitation and broken promises have atomized so many regions. Hugo and Fidel are symptoms of the disease--but are also the disease itself. It's a mess. But there is a model--Brazil is working--under a free-market socialist--whatever the heck that is. It can work. It is interesting that in those countries that experienced immigration by the 19th century Spanish middle class - Chile and Costa Rica, for example - the prospects for democracy are somewhat brighter than elsewhere. Heck, Fidel is one OF 'em. Yes, of a Galician family, from the northwest of Spain. Most of them were middle and upper middle class. If you didn't like 19th Century Catholic dogmatism, you made the easy slide to 19th Century Marxist dogmatism. Wonder how many of our Latin American FSO's have read the de Soto? Why you Americans no admit that the running dog lackey of United States imperialism is responsible for the torture and chaos. It was your CIA in Guatemala assassinating people for the United Fruit Company. At the end of May, the Central Intelligence Agency declassified 1,400 pages of reports on the 1954 coup it engineered in Guatemala to remove president Jacobo Arbenz from office. Arbenz became a target of U.S. imperialism for threatening to carry out modest land reforms against the interests of produce giant, United Fruit Company. In 1952, U.S. president Harry Truman gave the secret police approval to begin shipping guns and money to opposition forces and training mercenaries. The released documents show that CIA cops trained assassins to kill 58 people put on a "disposal list." They include a 22-page how-to manual on murder. Secret intelligence officials claim none of the missions were carried out. The list of CIA targets were also subjected to "nerve war," which included death threats, phone calls "preferably between 2 and 5 A.M.," frame-ups, and other forms of intimidation. Less than 1 percent of the CIA files on the Guatemala coup were included in the declassification, with many details blacked out. Then you tried to kill Fidel after that dog Batista finshed running for you. You have a Monroe Doctrine that is a useless piece of paper. You use our people like pack animals to make you clothes and do your farm work but won't allow us freedom. The drug cartels would not exists if the demand in the USA went away. But your bourgeois demand a steady supply. It is the only way for the peon to make a living. Your imperially sanctioned monopolies ,developed and owned by your banks private "Federal Reserve" play havoc with international currency for their private profit. Like every society that ever existed, America has had it�s issues with the megalomaniacal. But nobody else has been as good at keeping them somewhat checked and balanced. Senor Cruz, you speak communist lies in order to replace whomever is oppressing the people now, so that you can oppress them yourself instead in the future, no? Hmm. A critical mass of desperation and naivet� which gives the megalomaniac their power thru those easily pliable hope and fear variables? By the time people say �Uh, maybe this guy aint right� the new king usually has his system in place. In South America's case, dictatorship seems to be a consequence of a Spanish/French heritage. esp when compared to the different path taken by contemporaneous English-speaking New World settlers. You know, when Spain collapsed into civil war in the 19th century, Latin America looked naturally to France - and to the bureaucratic models of a bunch of Napoleons. So in many a Latin American capital, you have lots of granite and mansard roofs and avenues named for famous days and a Champ de Mars and all the other trappings of absolutist Napoleonic culture. It is everywhere to see. Were the CIA activity in governments in Mexico, Cuba,Guatemala,Peru,Chile,Nicaragua,Panama,Argentina,Venezuela, all lies? No amigo. They were done for imperialist bankers and Wall Street who finance imperialist companies to exploit the peons. Show me the the lies you say I tell. This information is what you have admitted to doing. Will Dr. Kissinger go the way of Pinochet for his assassination of freely elected Salvador Allende in Chile? Or in Argentina when he had Jorge Videla overthrow the democratic government of Isabel Per�n? Imperialist running dogs and liers. Please grade on a scale from 1-5, with 5 being the highest. If you have a favorite anti USA diatribe just ask me and I'll gin up a new hostile character to whip up the masses. Whip it, whip it good ! PS. transsexuals and cross dressers are extra. really whip it good ! ! ok, how about an anarchist throwing rocks at the cops in street, and bawling that his freedom of speech is being abridged when the cops get pissed off? no, wait, i missed my point --why should an anarchist even speak of rights at all? it's like a nihilist complaining about fairness. Huh? What? Anarchism leads to gangs, thugs and feudalism. Humans just coagulate that way when there's no structure. Rousseau, Marx, and Lewis are pushing up daisies. Dead men can't lie, but other's do it for them. Dylan is one of the best even though he has some not so popular sentiments. Washington,Adams Jefferson,Einstein, are all dead too..what's your point? Putting words in dead men's mouths doesn't fly, float or tread. Not when you do it or Lewis. �The goal of socialism is communism ..Maggies Farm is a self described 'commune" ..good work conrades. �If it were necessary to give the briefest possible definition of imperialism, we should have to say that imperialism is the monopoly stage of capitalism.�......US federalism is dead. The Federal government is the monopoly and imperial. All quotes by V.I. Lenin but you are imposing his theories nicely. That Lenin fella was absolutely (and i do mean 'absolutely') shameless about the murdering of masses of bodies, souls, and spirits, in order to serve his lust for power. And why not, with Man the new god ? But wait --if man is god, how can he be so mistreated? Maybe it's that "some" man is the new god. ALVARO VARGAS LLOSA on the Mexican problems that lead to illegal immigration to the U.S.: "What has been *the consequence of a century of collectivization of the land*? In the 1990s, when trade policies became more liberal, Mexico's rural population found itself caught up in an extremely inefficient system that was undercapitalized, making it very difficult for Mexican peasants to compete with the outside world. When the government finally allowed the villagers to sell the ejidos, something they had been prevented from doing since 1917, many of them put their land on the market and left for Mexico's cities. When the urban areas did not offer improved conditions, they migrated to the United States." Gosh, I don't know, maybe we should ask Jimmy Carter! give him heartburn --ask him in Yiddish. You running dog lackeys avoid your own history of oppression and imperialism, hiding behind concepts that you are no longer even free to have. Private property, no more amigo. Guatemala even though you know what they did. You believe Americans do not say it but the world knows of your imperialism and duplicity with your friends. Ask the South Vietnamese or the Angolans or the Czechs, or the others you have sold out in the end. Talk of that talk. You cannot for even after your government admits what it did in those places you don't want to believe it. You are the idiotas �tiles. strictly a raiding party, de la Cruz. you can't hold any ground with that blue-sky nonsense. Your talk of cielo azul is not to the point of talking about the imperialism your country admits to. It is arrogancia magn�fica for your country which is why you are hated so. You cannot face the truth of your past treachery. and just who hates us? your ilk, who are angry that you are no longer standing atop pyramids breaking open the chests of thousands upon uncounted thousands of Mestizos and yanking out their beating hearts? Talk to the facts of your imperialism that you admit. To lecture my ancestors on killing just remember the native American Indians you gave smallpox and other diseases to with full intent and knowledge too, that you hunted and scalped. Whose land you stole through fraudulent treaties you never honored. Yes it was white men who taught them to scalp. That is the white mans legacy of treating the Native American Indian, so you may save your lecturing. It was the start of your never ending imperialism that you are afraid to face. Instead you argue the actions of those you oppress. and tell the world, forgotten now by new generations of the Bay of Pigs and the Prague Spring where you imperialist fomented and promised help to those with the courage to rise up and then you , like the running dogs you are, ran away, and left them to hang, just as you did to the thousands of South Vietnamese you promised to get out if things went bad ..once again the running dog left them behind to be slaughtered. The people who had aided youe Embassy for fifteen years left to die. Running dog imperialists is a fitting name. Do not tell me of misdeeds by small countries. Talk about the SUPERPOWER USA and it's worldwide duplicity. Your country made Osama when it fit their purpose, and now you suffer from his retribution. in your blacklist. We also failed to save the Neanderthals from the Cro Magnons, for shame, for shame. But meanwhile, what about the Four Horsemen of the Apocalypse? Which nation has led the development of the systems which have done most to end mankind's great ancient scourges of War, Disease, Famine, and even, in our ever-lengthening life-spans, Death? Granted that the spreading of these great boons to the species has been opposed by atavistic revanchism at different points in space and time, and granted that sometimes this opposition has been temporarily successful. SANTIAGO, Chile (AP) - "Why don't you shut up?" That's was the message today from the king of Spain to Venezuelan President Hugo Chavez as he repeatedly tried to interrupt a speech at a summit of leaders from Latin America, Spain and Portugal. During his speech, Chavez referred to a former Spanish prime minister as a "fascist." When Spain's current prime minister later urged Chavez to be more diplomatic and respectful, Chavez tried to interrupt, but his microphone was off. 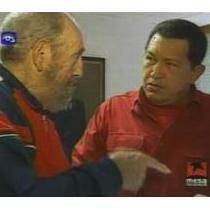 Finally, Spanish King Juan Carlos angrily turned to Chavez and said, "Why don't you shut up?" Sounds like Manos de la Cruz's final solution to the concentration of power riddle is the benevolent dictatorship. ...more accurately termed the "better hope it stays benevolent dictatorship". but yes i think many long for the Wise & Good King. But the Romans went from paying for psychopathic Nero�s downtown personal waterfront villa, to free entrance and great entertainment at Vespasian�s coliseum on the very same spot. Benevolent dictatorships work! Uh, but I guess that project was mostly built by conquered Jewish slaves and cash. Never mind. I agree, there are many who need the "good king." This might be part of the design - without such people around a social society might not be possible. that's true --too many iconoclasts and BOOM! Buddy..you need to go back and read post#8 again.......I think I did a damn good job as the angry Latino revolutionary. habu, you is an agent provocateur if ever they wuz one! well lots o'times these blogsites can turn into choir practice, the only distinction is how the agreement will be structure, prose,poetry, youtube reference, etc.....I hope I didn't drive your BP too high. I thought for sure the game was over when I announced it but when I realized it made no impression it was time for the running dog lackey imperialists to get another dose. My friends tell me I'm fairly effective at arguing both sides of a topic. well, it's all to the good --how else would i have found that '4 horsemen' file-closer ? Some cause happiness wherever they go; others, whenever they go You may go now, especially in light of your newly discovered illnesss, which I hope isn't trivial. Your schadenfreude is a blessing to us all. Your writngs never rose to the the level of scilocism. It was simply a fascade of a junior college drop out. Best of luck handling the drive through window at lunchtime. It should be quite a challenge. manos, must you be cruel to the irish poet? But, back onto the topic of American perfidy, just think, if the American Left has harmed the free world and the nation and the US military by ginning up an American defeat in Iraq, just think what the American Left has done to poor old AQ, by promising it a victory and then betraying it by letting the Americans keep fighting? Shame on the lot of them --where was Jane Fonda when AQ needed her? Please, your expertize on the socialism far surpasses mine. Do y'all have Boliviarn drive in for goat milk? Now, that I could navigate. Who are you little tiny people telling to shut up? Hugo, judging from your recent appearance, perhaps the King was advising you not to quit talking but to quit eating. Beware taking on more of a hog aspect, as you may find yourself soon spitted over a slow fire.